Ludogorets struck late against 10-man Basel in Group B to win 1-0 and record their first UEFA Champions League victory. The visitors were forced to play at a man disadvantage from the 18th minute when Geoffroy Serey Die was sent off for a challenge on Cosmin Moti, to the consternation of his team-mates. Paulo Sousa’s side looked like holding on for a brave point until left-back Yordan Minev popped up with a dramatic winner in the first minute of stoppage time. Ludogorets had looked devoid of ideas after Basel dropped behind the ball, reduced to shots from distance and an ambitious chip from Dani Abalo the closest they came to scoring. But the left-back snatched victory late on, making Ludogorets the first Bulgarian team to claim a point in the competition and changing the dynamic of the group as the hosts climbed above Basel, who beat Liverpool on matchday two. Basel started the game without the injured Marco Streller, who scored the winner against Liverpool, and 17-year-old Breel Embolo impressed in his place, leading the line and feeding off scraps for the majority of the match as he was left isolated up front. These teams met at the play-off stage of this competition last season as Basel advanced 6-2 on aggregate. But neither side seemed willing to give too much away in the early exchanges this time, which suited the visitors as they sought to puncture the atmosphere and keep possession. The game burst into life in the 17th minute as Marcelinho drew an impressive save from Tomas Vaclik, meeting Fabio Espinho’s whipped free-kick with a full-length diving header from eight yards. That brought the crowd into the game, and a minute later the volume increased still further as Basel’s combative midfielder Serey Die was shown a straight red card. The Ivorian had already committed to a series of robust challenges but this time was judged to have gone over the ball on Moti, leaving his side to play with 10 men for more than 70 minutes. 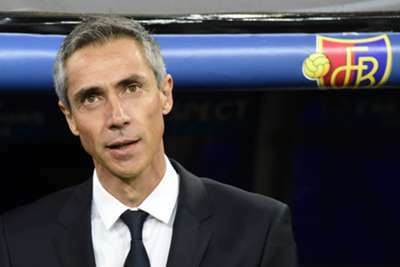 Basel proceeded to drop deeper behind the ball, but only after a period of pressure that saw Derlis Gonzalez test Vladislav Stoyanov with a curling shot following neat build-up, in the 28th minute. Ludogorets struggled to deal with the visitors’ switch in shape, making poor decisions in the final third and failing to create anything clear-cut. The hosts improved after the break, however, and Vaclik had to backpedal quickly to tip Abalo’s clever chip over the bar in the 52nd minute. But Ludogorets failed to build on that good start to the second half. Younes Hamza wasted their only half chances until Minev popped up on the counter-attack with a well-struck shot from 18 yards that bounced past Vaclik and into the bottom corner.